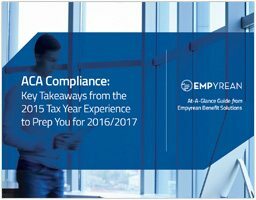 Get Ready for Next Year’s ACA Challenges with this Free At-A-Glance Guide. The first ACA reporting cycle is over, but the compliance challenge only gets more difficult from here. Now employers face massive potential penalties and more responsibility and risk than ever before. ACA compliance requirements are still a moving target. Start strong by understanding your complexity and risks. Lay a foundation of good data. Despite its complexity, meeting the ACA’s requirements can be a fairly straightforward task. Download our latest At-A-Glance to learn how you can lower your ACA risks, minimize administrative burdens, and bring HR’s focus back to the initiatives that matter most.